The chest bag is vintage and retro. Material: Outer: Premium Polyester (water repellent but not completely waterproof, you can use this bag in rainy days) with PU Leather Decoration; Inner: polyester lining; white smooth sturdy zippers for better performance. Size: 10.6*4.52*13.97 in (L*W*H). Weight: approx. 0.72kg. The shoulder bag can fit a slim laptop up to 13" without laptop sleeve/case. The full length of the strap: approx. 41.5in. This sling bag is not a large backpack, but it is a great size to take to a day trip or shopping. The chest bag is vintage and multifunctional with lots of pockets: 1 main zipper compartment with 1 padded laptop lining; 2 inner open pockets; 1 inner zipper pocket for valuables; 1 front big zipper pocket for snacks, notebooks, pens, etc. ; 1 front small zipper pocket can put tickets and passport for easy access; 2 side pockets for water bottle or umbrella, the water bottle pocket can be adjusted by a zipper to fit different size bottles. Comfortable: Airflow padded adjustable shoulder strap for all day comfort. The messenger bag has a top handy PU handle for easy grab and hang, added versatile for this pack. It can act as a single-shoulder bag/sling bag, or a cross-body bag for use. 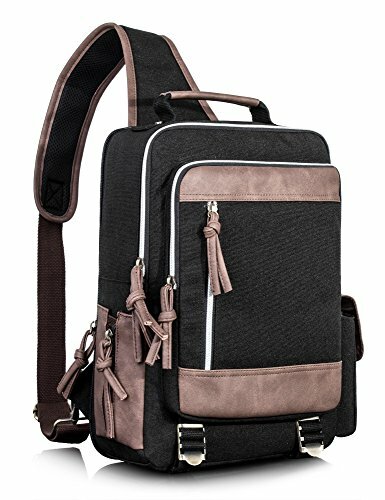 It is a great daypack for school, dating, shopping and traveling in daily life. It can also be carried for outdoor activities, such as running, cycling, camping, etc. it is a unisex bag: a great gift for your friends and folks.